Matthew Bourne’s Swan Lakecomes to cinemas with a fresh look for the 21stcentury and is ‘as bold and beautiful as ever’ (★★★★★ Telegraph). This thrilling, audacious and witty production is perhaps still best known for replacing the female corps-de-ballet with a menacing male ensemble, which shattered convention, turned tradition upside down and took the dance world by storm. 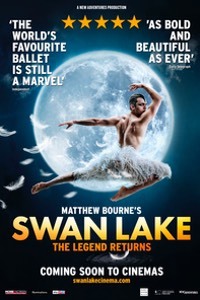 Filmed live at Sadler’s Wells Theatre in London, this ‘spellbinding’ (★★★★★ Independent)re-imagining of the classic New Adventures production stars Will Bozieras The Swan/The Stranger, Liam Moweras The Prince and Nicole Kaberaas The Queen.